Our Young at Art Exhibition will be featured in our gallery between August 1st and August 29th, every Wednesday through Saturday between noon and 5:30 pm. 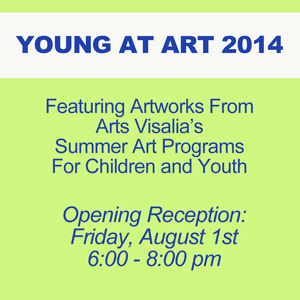 An opening reception will be held the evening of Friday, August 1st from 6:00 pm to 8:00 pm. Admission is free and open to the public, so bring the whole family! Arts Visalia’s Youth Education Programs have been made possible, in part, thanks to the generous support of grants from the United Way of Tulare County, Southern California Edision and the City of Visalia Non-Profit Youth Grants program in addition to private donations to our Art Scholarship Fund.